Devi Navaratri is starting from tuesday 16 october to wednesday 24 october. Devi Navratri is a festival Goddess Durga Devi is worshiped in nine avatars. During these nine holy days, each day goddess Durga Mata is worshiped in different avatara. 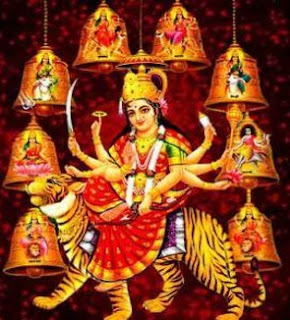 Navratri festival is observed twice a year, once in the month of Chaitra occurs in march or April and then in Aswayuja occurs in September or October. Devi Navaratri which occurs in chaitra masam is called as Vasanta Navaratri. Sharad Navaratri is most importent As it also called as Maha Navaratri. Navarathri is celebrated in different ways throughout India. Devi Navaratri is big festival in india, during this days The goddess is dressed differently and perform pooja. 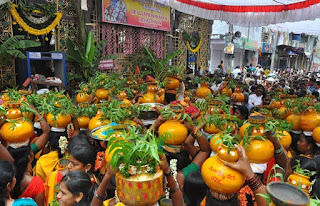 pouring panchamrutham (ghee, honey, curd, milk, and finally with water) on the idol than decorating with flowers, vermilon (kumkum), turmeric, Sandal wood (gandam). This nine days seperated into three as first three days are celebrated for spiritual force called Durga as destroy all our impurities. then next three days are celebrated for spiritual wealth Lakshmi as she is the goddess of wealth. Last three days are celebrated for goddess of wisdom Saraswati. Nice Post...May this navratri bring happiness and Prosperity to all..Happy Navratri..Thanks for sharing.